JENNY OAKS BAKER is a Grammy Nominated, Billboard No. 1 performer and recording artist. She received her Master of Music degree from the renowned Juilliard School in New York City and her Bachelor’s Degree in violin performance from the Curtis Institute of Music in Philadelphia. She has performed as a soloist at Carnegie Hall, Lincoln Center, Strathmore Hall, the Library of Congress and as a guest soloist with the National Symphony, Jerusalem Symphony, Pittsburgh Symphony, Utah Symphony, and the internationally acclaimed Tabernacle Choir on Temple Square. Over the years Jenny has collaborated with such luminaries as Gladys Knight, Marvin Hamlisch, and the former Secretary of State Condoleezza Rice. Jenny has released fourteen studio albums since 1998. They have sold nearly a million copies and consistently chart on Billboard. Jenny’s emotionally stirring music has also been featured on the soundtracks of many films and music from her Grammy Nominated Album, Wish Upon a Star is featured at Disney’s Magic Kingdom and Disneyland to introduce their nightly fireworks shows. Her popular music videos can be viewed on her Youtube Channel. Jenny, her husband Matthew, and their four children (Family Four) reside in Salt Lake City, UT. Jenny Oaks Baker & Family Four have performed throughout the United States including performances in Abravanel Hall and Red Butte Garden in SLC, Stevens Performing Arts Center and the BYUI Center in Idaho, multiple times on the Hour of Power TV Show broadcast worldwide from California, for Ambassador's Wives at the Congressional Club in Washington DC, for the Music Educator’s Rally at the Utah State Capital, for the Washington DC Temple Festival of Lights, for the World Congress of Families IX and at First Night On Temple Square. 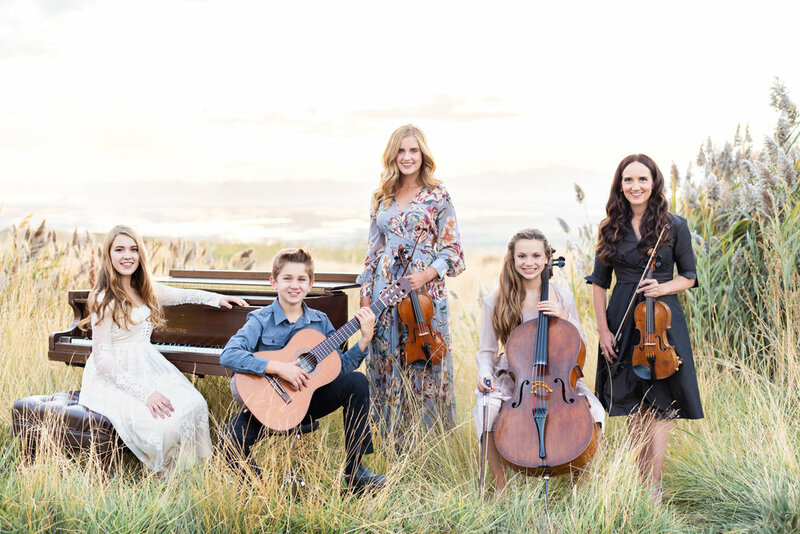 They have also performed the National Anthem for the Days of Forty-Seven Rodeo and twice at Utah Jazz Basketball Games at the Vivint Smart Home Arena, for First Night at Temple Square and soloed with The Utah Symphony, The Millennial Choirs and Orchestra, The Lyceum Philharmonic and the BYUI Combined Choirs and Orchestra. Jenny Oaks Baker & Family Four have performed in Vienna, Austria; Athens, Greece; Korce, Albania; Tirana, Albania; Osaka, Japan; Tokyo, Japan and throughout Taiwan. Family Four are also featured on many popular music videos and on Jenny Oaks Baker’s newest CD "The Spirit of God”. Laura is 17 and plays the violin and percussion. Hannah is 15, plays the piano and studies with Dr Irene Peery-Fox. Sarah is 14, plays the cello and studies with Dr Alison Wells. Matthew is 12 and plays the classical & electric guitar. He studies classical guitar with Douglas Rogers and electric guitar with Larry Green. Jenny and her children have been performing together as a family since each child started playing their instruments when they were three or four years old. Their father, Matt Baker is very musical, and enjoys being a DJ when he is not working as a Sales Executive. He also helps with all the necessary sound equipment for the Baker Family, pays for lessons and is incredibly supportive of his artistic wife and children.